Old Man Crow and I work as horticulturists to pay the rent, keep food on the table & has the added bonus of keeping our feet firmly planted in the ground. 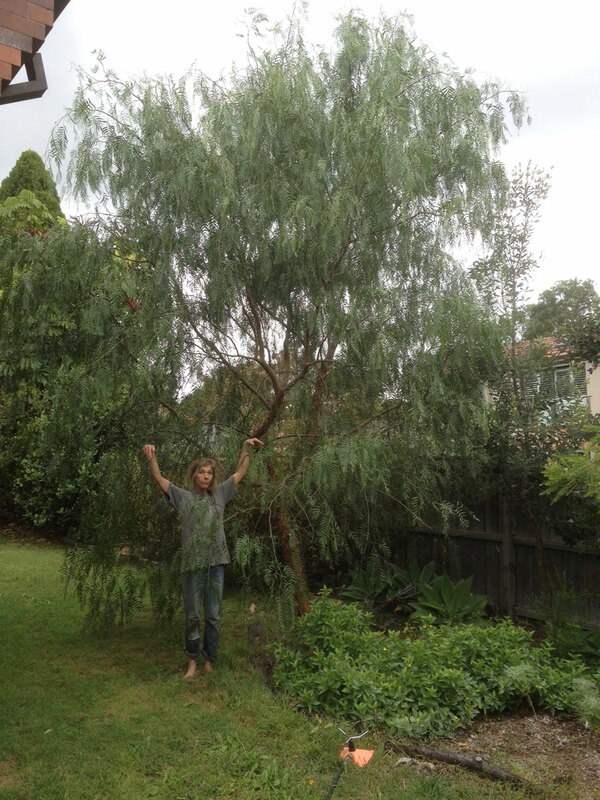 This is a photo of me with a Peppercorn (Schinus molle) we planted two years ago to send to another customer as I want to plant one in her garden for shade. I love the aromatic foliage, graceful habit and small pink berries. And wish I had a S. molle. (((Di))) it’s my favourite tree, have planted lots of them in my 42 years of working as a gardener! Love how the tree is hugging you .. can’t wait to put my barefeet into green grass. Such a BLESSING being able to earn a living doing what you love. (((Tina))) one of the best lessons in this lifetime happened when I was so weak from the radiation therapy for throat cancer back in 2004 that I couldn’t garden or even hold a pencil to draw a line. I missed gardening and making art to the same measure. another leunig fan! I have a collection of his books by my bed! (((Susan))) Leunig has kept me almost sane ever since we first arrived in Melbourne in 1969! (((Gab))) good tip, I grew Juniper years ago when I lived out in the bush with the dream of distilling my own gin! a very good day job! (((Velma))) they say gardening is good for strengthening old bones, I love that we get paid to stay fit & having our hands touching mother earth is food for the soul! Lucky, lucky you to Love your “job” so much! Its fun seeing you in this way. (((Nancy))) when I finished art school and started looking around for a way to make a living in 1990 a gardening position was advertised at the Sydney Botanic Gardens so I applied and was employed on the condition that I would go to Ryde technical college to study the three year Advanced Certificate in Urban Horticulture evening course. When I finished the course I left the Botanic Gardens to start MeMo Garden Services with Old Man Crow in 1994 and bought out his partner in The Happy Triffid indoor plant hire in 1996. The gardening supports our art and music, as well as providing shelter, food and some semblance of sanity in an increasingly mad world. Mo…………. you lovely green garden fairie………what a wonderful way to make a living! (((Martine))) each garden is made with the customer’s dreams of paradise, creating a peaceful space to retreat from the hustle and bustle of living in a huge city of 5 million people. (((Margaret))) reckon it’s a bit too cold for a Jacaranda down there, you could have another go near a warm NE facing wall with mulch and frost protection in winter. Peppercorns aren’t keen on the cold either but your Silky Oak should be fine now that it’s established. I love the combination of Jacaranda, Silky Oak and Flame Trees in spring on a good year when they all flower at the same time! What a gorgeous tree, Mo, you look as if you came forth from the center of this magical tree; a woodland goddess…To love what you do to pay the rent, put food on the table is a gift because not many can say the same…someone said once that their day job was how they lived, their art was their life- here I think the joy of both, for you, is at times, interwoven. (((Marti))) the gardening feeds the art and the art feeds the gardening, there is no separation for us these days. You’re both such inspirational people. I’m so grateful that we met. (((Chester))) and you inspire us I look forward to the day when we can take that long drive up the coast and visit you & your beautiful home! Getting to know you 🎶🎵🎶 getting to know all about you 🎵🎶🎵 sharing some of your personal story’s are welcomed and appreciated. We all do have a story … BeautyFull BLESSINGS to you and your old man Crow. (((Tina))) I used to dream about retiring one day but Old Man Crow reckons we will work til we die as we haven’t saved a bean and y’know I’m feeling okay with that these days, a good friend has the best glass studio up in Far North Queensland with a huge garden that’s getting too big for him to look after on his own, I’m dreaming when Sydney gets too expensive we will pack up and see if we can cobble a life together up in the tropics! Well, teach me something new and colour me pink! As a florist, i’ve used this, usually around Christmas, and always assumed it was a bush or vine–what a vision this is, like a weeping willow. I had NO idea! (((Arlee))) it’s such a beautiful graceful shade tree with a broad spreading dome but it’s an opportunist & can cause problems with drains, paving and retaining walls. Goddess of the garden! I envy you in a way, but I do not miss the labor just the being with plants. 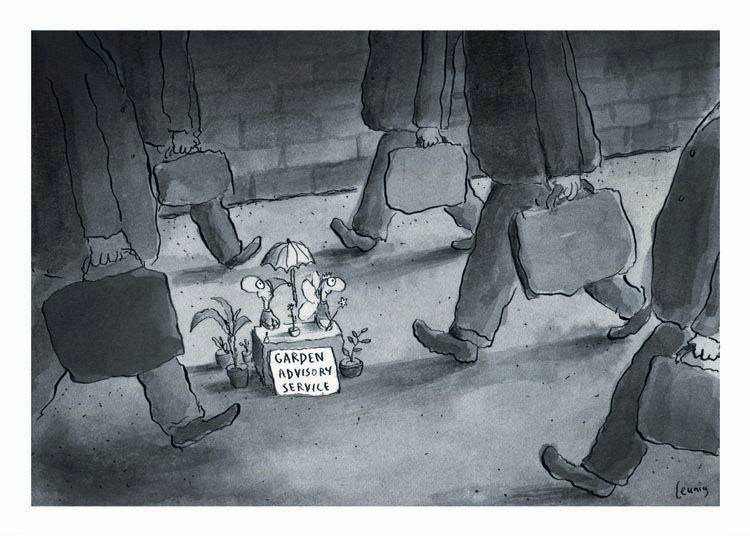 Oh Michael L has made such a touching drawing…poor little gardeners among the rushing feet! (((Michelle))) you have the magic of Central Park & the High Line to wander in to your heart’s content! One of the best things about leaving the job at the Sydney Botanic Gardens was I stopped looking at all the weeds and the plants that needed pruning and started enjoying the beauty of just being with their wonderful collection of plants again! You are one with that tree…I can imagine the roots that are stretching off of your toes! (((Hazel))) I don’t always get to work barefoot, had totally soaked my workboots fixing the watering system in another garden ! (((Jude))) love the quiet power of trees, how they steadfastly weather the storms, enjoy the good years that have plenty of sun and gentle rain and grow more graceful with age. Ahhhhhh ((MO)) you ARE a tree ! … how great ! Love seeing you in the green, Mo. Gardening season gearing up here not soon enough. (((Susan))) this week is starting to feel like autumn with cool crisp mornings and that lovely long light, good to hear spring has sprung at last up there in the north countries! love this tree spirit pic Mo! (((Barry))) when I was young my ambition was to make a living out of art & gardening and we do!